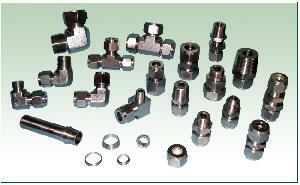 The J.J.HYDRAULICS tube fitting is a mechanism used both to seal and to grip tubing. The mechanical advantage and geometry of this kind of fitting produces a leak-tight assembly. To assemble, simply insert the tube into the complete assembly until the tube bottoms-out against the shoulder of the fitting body (1). The two ferrules are driven forward between the nut (4) and fitting body using the mechanical force created by rotating the nut clockwise. The back ferrule (3) is driven against the tapered rear of the front ferrule (2) and the front ferrule is driven by force into the tapered mouth of the body. The rear ferrule is swaged radialy inwards on the tube while lifting the front ferrule out to form a full-faced seal on the tapered surface of the body. The 1 1/4 turn of the nut from the hand tight position assures consistent drive of the sealing members. This ensures an effective seal against high pressure as well as ultra high vacuum conditions.